BRIDGEPORT-- It wasn't easy, but the Darien High boys ice hockey team remained undefeated against the FCIAC. The Blue Wave scored three second-period goals and held on for a 3-2 victory over Fairfield co-op Saturday at Wonderland of Ice. Brendan Hathaway had two assists, and Craig Miller, Trent Bergin and Nicholas Allam all scored goals as Darien improved to 6-1-1 and 2-0 in the FCIAC. "They were a good team, I'm just glad we could take care of them," Hathaway said. "It's our second win in the FCIAC ... we're 2-0 in the FCIAC and we'll keep rolling from here." Charlie Meder had a goal and an assist for Fairfield, which fell for the second straight game against a Division I FCIAC opponent. 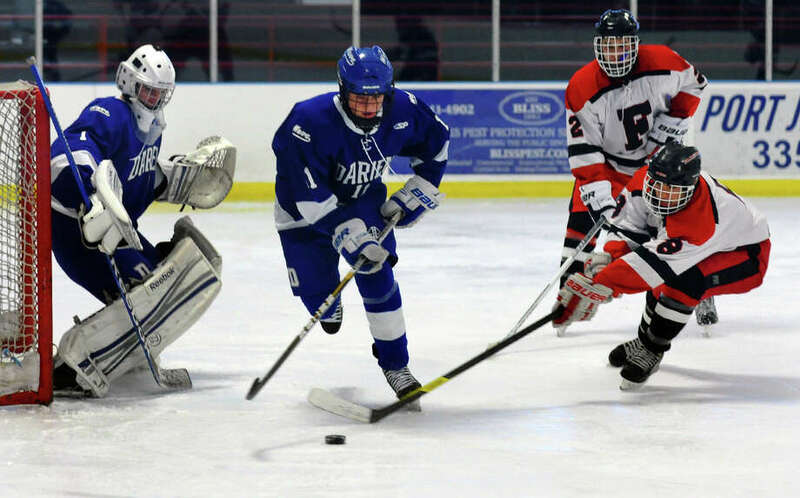 "Darien is a top-five Division I team," Fairfield coach Mark Pettorini said. "This game was a bad-hop away of being something real good for us. I'm happy with the effort, not so happy with the outcome." Bergin's goal with just 2:26 in the second broke a 2-2 tie, ultimately serving as the game-winning goal. The senior forward settled a pass from Hathaway, switched to his forehand and beat Fairfield goalie Conner Frawley. "I know if I give him the puck in the front of the net, he can bury them," Hathaway said. "I just fed him and he buried it." Darien's backup goalie Michael Colon improved to 2-0 this year, stopping 16 shots -- eight of which came in the third period. Colon robbed Kevin Robinson's breakaway with only 1:30 left in regulation, keeping Darien on top. "It's good to give other guys opportunities, because you never know when you're going to need them," Darien coach Chris Gerwig said. Meder, serving as Fairfield's lead forechecker on its trap, broke the scoreless deadlock at 7:38 of the first. The senior forward stole an errant pass from a Darien defender and beat Colon between the pads, putting Fairfield up 1-0. "Their coach did a great job of throwing some different looks at us," Gerwig said. "In the first period, I think they outplayed us and outworked us." "We threw a trap at them, and it seemed to work in the beginning," Pettorini said. The Blue Wave tied the score when Allam's shot from the point beat Frawley for a power-play goal just 54 seconds into the second. "Any time you can get a goal like that it picks you up a little," Gerwig said. Darien struck just five-and-a-half minutes later when Miller's wrister beat Frawley over the shoulder, giving the Blue Wave a 2-1 lead. "He's got a real great squad," Pettorini said of Gerwig. "The quality of hockey player is next to none down in Darien." But Robinson tied the score only 2:01 later. Meder fed Robinson a sneaky pass from behind the net, and the junior forward beat Colon on the forehand. Darien also picked up a 7-1 win over Wilton on Monday to improve to 7-1-1. Records: DHS 6-1-1; F 2-4. Goals: D-- Nicholas Allam, Trent Bergin, Craig Bergin; F-- Charlie Meder, Kevin Robinson; Assists: D-- Brendan Hathaway 2, Robert Juterbock; F-- Meder; Goalies: D-- Michael Colon (16 saves); Conner Frawley (26 saves); Shots: D 29, F 18.